Out of the tiniest crevices in the rocks, out of old walls, on ruins in the middle of Chania, on the rocks of the gorges of Imbros or Samaria, on the walls of the cisterns in ancient Aptera, yes all over sunny, dry, rock crevices in Chania, you will meet this spectacular Campanula relative. It grows wild on the most minute rock crack. The plant of my drawing I have found in the middle of one of the busiest tourist places of Western Crete: growing out of the walls of the old Arsenali, in the tourist harbor in Chania. In Crete this plant is quite common, but still it is an exciting plant to see. 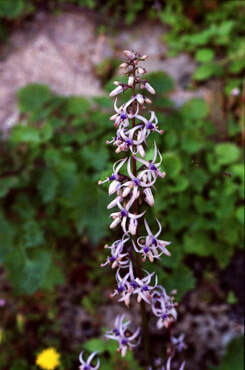 It is a Cretan endemic, meaning that it grows (in the wild) only in Crete. But because it is native to Crete it is not very difficult to cultivate it in temperate climates and you’ll find it in many (rock-)garden-centres in Europe and America. The leave lobes are toothed or cut (pinnatipartite or pinnately-lobed to pinnatisect) (with a large terminal segment) which is unique in the Campanulaceae (Bellflower family), giving them a little the appearance of celery or parsley. The robust Petromarula pinnata makes a rosette of these pinnately-lobed leaves, up to 30 cm in diameter out of which hairless unbranched stems full of flowers come, up to 80 cm high. The leaves are edible and can be used like lettuce. Actually, the name Petromarula comes from the Greek petromaroula and means ‘rock/stone lettuce/salad’, referring to the pleasant taste of these leaves. In April, the stunning up to 80 cm long bloom spikes (racemes or spicate panicles) appear bearing absolutely abundant, more then 1.5 cm large, starry white and pale-blue-lavender (mauve?) flowers in clusters pushing the spikes out to 7 cm in diameter. And large mature plants can have up to 30 of these stalks filled with flowers. The flowering goes on until June/July. It looks like the plant cannot stand the heat of the Cretan summer and it seems to disappear. But it is a perennial and after the autumn rains a fresh rosette of leaves comes back again. The 5 stamens have filaments that are swollen at the base, forming a dome over the receptacle (over the base the inferior flower); the anthers are free but stand together forming a tunnel around the style. The petals are about 1 cm long and linear, the style is much longer ending in a knob-like stigma (the stigma head). The fruit is a capsule with three pores opening at the middle. Let’s take a look at the drawing. Hereafter numbers between brackets refer to details in the drawing. 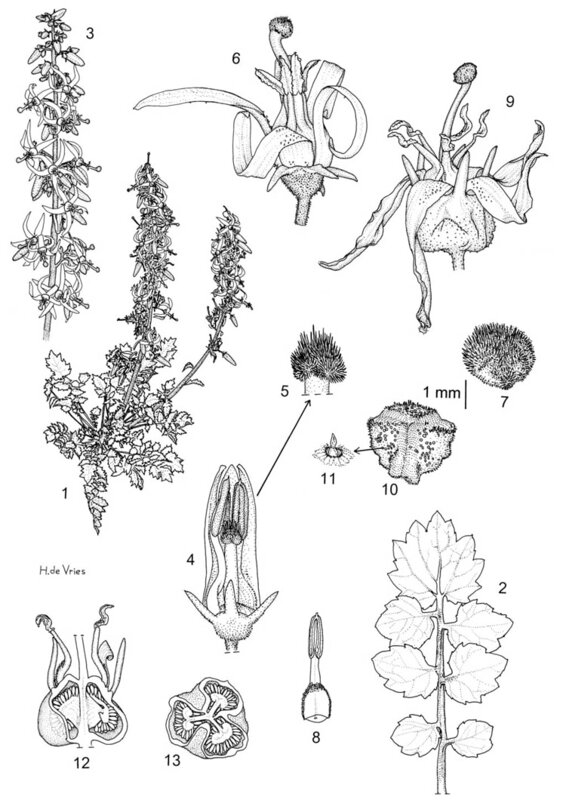 Detail number (1) shows the habit of a plant growing out of a wall; (2) is a leaf; (3) shows a part of a flowering spike; (4) an opened bud with anthers still full with pollen; (5) the stigma or stylar head of a large (but not yet open) bud; (6) an open flower; (7) a stigma in the mature flower stage; (8) an anther with filament with swollen base (inside view); (9) is a ceased flower; (10) the stylar head or stigma in a ceased flower; (11) is the pit of a hair of detail nr 10; (12) a lengthwise section of an ovary and (13) is a transverse section of an ovary. But let’s return to the stigma, the stylar head, of the flowers, because there is something very special going on over there. In detail number (4) you’ll find an opened bud and you can see that the anthers are still closed and full with pollen and they form a kind of conical tube that like a cylinder or dome overtops the stigma. The stigma (detail 5) is composed of three lobes or carpels, is more or less globose (and not cylindrical like in most Campanulaceae) and covered with approximately indistinct 9 rows (three on every lobe: two on the sides and one in the middle) of long, straight hairs, the longest at the top and gradually shorter and smaller from the top downwards. In a number of plant-species the pollen is not presented to the pollinators from the anthers, but from other organs. This is called Secondary Pollen Presentation. Please take a moment (some other time, of course) to read my article about Solenopsis minuta ssp.annua, where the pollen is forced out of the anther tube by the elongation of the style. In different genera there are a number of ways of this secondary pollen presentation : pollen presented from the petals, from staminodes and so on. In Petromarula pinnata pollen is presented to the pollinator from ........the style. When the 5 introrse (opening internally) anthers dehiscise, the pollen are deposited on the top of this peculiar stigma with its long straight hairs. This stigma has some additional structures in the shape of flat, sticky surfaces on the flanks where there are no or only very short hairs, to ensure that all pollen grains are collected and no pollen fall between the style and the anthers and would be lost. Now the style elongates and lifts the stigma, now stacked with pollen, until it reaches the top of the still closed dome of the conical tube formed by the now empty anthers and the petals. In this way the pollen is pressed onto the top of the stigma and between the large hairs. In the meantime the sticky spots on the sides of the stigma have dried. Now the pollen is exposed and, no longer held together by the pollen-collecting hairs, is presented to flower visitors. At the same time, the stylar head starts to curve so that eventually the whole stigma faces upwards. The pollen is mostly collected by solitary bees, see photograph 2. 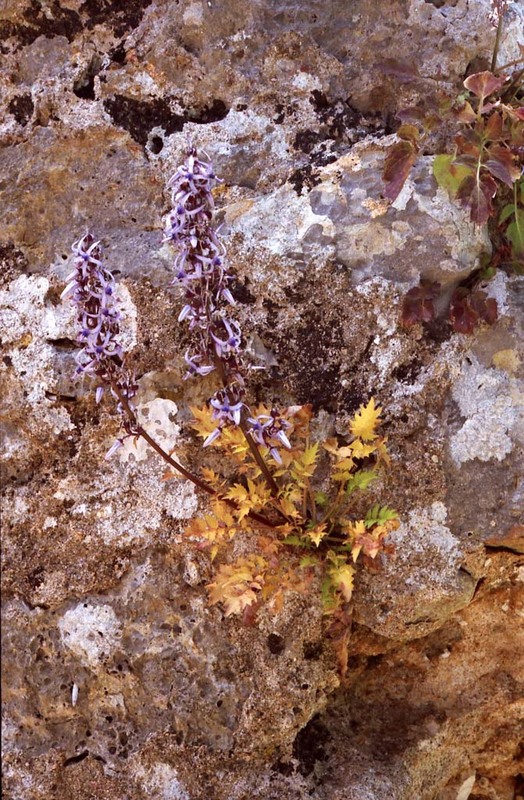 This plant grows in the wall of the Arsenali, in the tourist harbor of Chania. The stage described above, is called the “functionally male stage of the flower”. Not the anthers present the pollen to the pollinators, but the stigma (the stylar head) presents the pollen. In this stage there is no fertile stigmatic tissue and the flower itself can not be fertilized.....yet. Now the stigma is clearly facing upward. The surface looks more or less hairless and is dotted with pits (11) from the invaginated hairs which are now embedded in the style tissue. Finally the flower enters the”functionally female stage”. The three lobes of the stigma are pressed away from each other by the inner tissue and the receptive areas protrude (10),see an excellent photo of both the male and female stage at: http://www.greekmountainflora.info/Crete%20Jalbum/slides/Petromarula%20pinnata%20southwest%20Crete%20087.html. The fertile stigmatic tissue is of the dry type and consists of unicellular papillae. The scientific name is Petromarula pinnata (L.) A.DC. However, the name of the author is regularly mistakenly written as DC or ADC. “A.DC.” stands for Alphonse Louis Pierre Pyramus de Candolle (1806-1893), not to be confused with his father Augustin Pyramus de Candolle (scientific abbreviation for this author is “DC.”) or with his son: Anne Casimir Pyramus de Candolle (1836-1918) (abbr. : “C.DC.”). If you want to use this drawing, don’t just steal it but hit the “copyright”-button in the menu and follow the instructions.